Disneyland, like many theme parks and tourist destinations, doesn’t allow dogs and family pets inside the park. They do allow “service animals” — that is, ones that assist the blind (a.k.a “seeing eye dogs”), the deaf or epileptic (“alert animals”) and the disabled (“companion animals”). Follow this link to read the information published by Disneyland (a pdf guide) for guests who wish to bring their service animals to the park. While pets are not allowed in the park, several hotels near Disneyland are “pet friendly” places to stay. You can follow that link to learn more about the pet-friendly hotels near Disneyland. If you bring your pet on your Orange County vacation, when you go to the park you can take your dog (or cat, bird, rabbit or ‘non-venomous reptile’) to the Disneyland Kennel Club (“DKC”), which is near the main entrance to the park, just to the right. You can follow that link to read DKC reviews on yelp. If you drive, you should park in the “Mickey and Friends” parking lot and walk to the DKC. (Your dog can no longer ride on the shuttle tram that goes from the parking lot to the main entrance, as Disney no longer owns the tram service.) You’ll also need a leash. At the time of this writing, the daily fee for boarding your dog (or cat, etc.) is $20. It’s only a “day spa” — no overnighting is allowed. To protect all dogs, proof of current vaccinations for rabies, hepatitis and distemper are required from your vet. Cats also need proof of feline leukemia, rhinotracheitus and calcivirus vaccinations. Be sure to bring the paperwork, and you will probably want to give DKC a call in advance to ensure this list of requirements is up to date. The phone number is (714) 781-4565. The kennel “cast members” will feed your animal from park-provided food (or you can provide your own food), but you will need to walk your dog yourself if you want him walked during the day. There is lots of other stuff to do at the Disneyland Resort — great shopping, restaurants, walks and the like. You can take all that in, free of Fido, if you want. Just be back before the Disneyland Kennel Club closes, 1/2 hour after Disneyland itself closes. Whatever you do, don’t leave a dog or cat in a car in the parking lot. The Southern California sun can get beastly hot in a hurry, even with the windows cracked. Dogs have died that way, and owners are subject to arrest, fines and even jail time. Leaving an animal in the car is against California law. 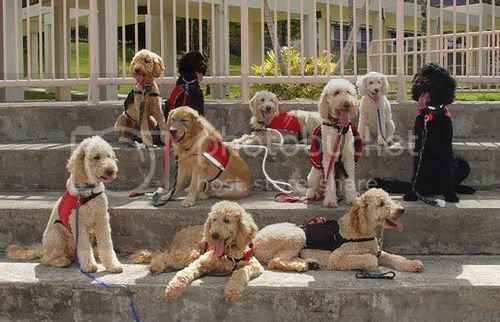 Photo of Service Dogs group shot by Beverly & Pack via flickr (Creative Commons).